Most Americans know the Constitution as the central document to the United States, can describe some of its major points, perhaps even quote certain passages. But how many know the stories of the 39 men who signed it? Among those who gathered in the summer of 1787 were merchants, lawyers, duelers, drunks; men who argued yet knew how to compromise. Experienced voice Actress Susan Larkin performs this audiobook, which is made up of snapshots of each man, painting a vivid, living picture of the signers and their times. Larkin speaks in a straightforward and engaging manner keeping this a light tidbit for the student of history or any curious American. With their book Signing Their Lives Away, Denise Kiernan and Joseph D’Agnese introduced listeners to the 56 statesmen (and occasional scoundrels!) who signed the Declaration of Independence. Now they’ve turned their attention to the 39 men who met in the summer of 1787 and put their names to the U.S. Constitution. Signing Their Rights Away chronicles a moment in American history when our elected officials knew how to compromise - and put aside personal gain for the greater good of the nation. These men were just as quirky and flawed as the elected officials we have today: Hugh Williamson believed in aliens, Robert Morris went to prison, Jonathan Dayton stole $18,000 from Congress, and Thomas Mifflin was ruined by alcohol. Yet somehow these imperfect men managed to craft the world’s most perfect Constitution. 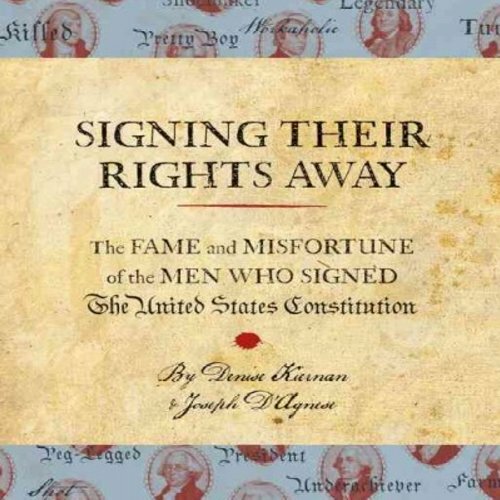 With 39 mini-biographies Signing Their Rights Away offers an entertaining and enlightening narrative for history buffs of all ages. ©2011 Denise Kiernan and Joseph D'Agnese (P)2013 Audible, Inc.